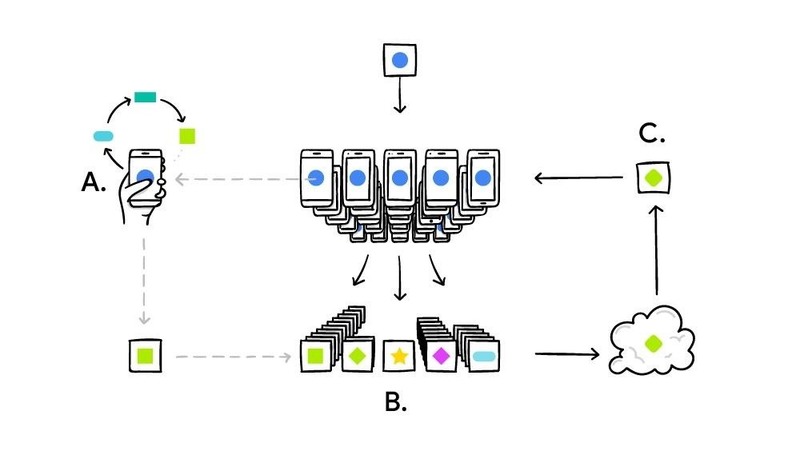 Google, the company that rules the internet, is now testing a method to leverage its machine learning with its ubiquitous presence on mobile devices. The new model they're employing is called Federated Learning, and it hopes to apply artificial intelligence to Google's services on Android without compromising user privacy. The Federated Learning model would be downloaded directly onto a mobile device. It would then learn from data gathered by Google's apps and services, and apply this knowledge as an update to improve the experience on your phone. Fairly straightforward so far, right? But the trick would be gathering and using this data without compromising the user's privacy. To accomplish that, the information is encrypted, anonymized, and aggregated with other users' data before being analyzed in the cloud. The combined user data is then used to improve the base model of Google's ecosystem. But before the aggregated data is used to improve Google services on the whole, a bit of machine learning is applied locally to enhance your personal experience. This act takes place strictly on your phone, and is not shared with Google's cloud-based AI until after it's been anonymized and combined with other users' data. The improvements made by the local AI will happen immediately, "powering experiences personalized by the way you use your phone." To sum it up, research scientists Brendan McMahan and Daniel Ramage stated in a blog post that "Federated Learning allows for smarter models, lower latency, and less power consumption, all while ensuring privacy." As someone who relies on autocorrect heavily to text a coherent sentence, I'm curious as to how well this system will work out. What about you? Share your thoughts on Federated Learning in the comment section below.